G.168 Line Echo Canceller Software is fully compliant with ITU G.168 specification as well as satisfies our own rigorous proprietary tests. Our line echo canceller software is designed to pass and exceed requirements using any of the G.168-2012 echo path models as well as applicable customer models. VOCAL provides robust echo cancellation and noise reduction algorithms that can be configured to significantly reduce echoes and remove residual noise from the voice signal. Contact us to discuss your voice application requirements. VOCAL has developed a range of line / network echo canceller solutions which are installed world-wide and used in the public telephone system and TDM echo cancellation circuits, VoIP applications, and many other types of manufactured products. VOCAL’s experts can help you select and configure the algorithms that best fit your needs. The G.168 Line Echo Cancellation algorithm is available standalone, as part of an embedded library, or with a complete ATA/VoIP Gateway solution. Our G.168 software is optimized for DSPs and conventional processors from TI, ADI, ARM, AMD, Intel and other leading vendors. Custom solutions are also available. The G.168 specification was developed to address and standardize the performance for line echo cancellation in the PSTN. G.168 strictly limits the convergence time, allowed residual echo, tolerance for varying signal levels, and allowed divergence in the presence of destabilizing narrow-band energy. The line echo cancellation requirements also specify the performance of any additional non-linear processing such as clamping and/or suppression, ability to handle data communication, and disabling signals such as the modem ‘ANSam’ tone. Addendums to the original G.168 specification from 1997 further restricted and quantified the requirements for line echo cancellation algorithm compliance. G.168 Line Echo Canceller must be placed in the 4-wire portion of a circuit (which may be an individual circuit path or a path carrying a multiplexed signal). While intended for use in the PSTN, the extremely high performance and versatility of G.168 compliant algorithms allow them to be used in a wide variety of applications for line noise cancellation. For VoIP and embedded devices, the line echo canceller may be placed after an audio codec (such as G.711, G.722, G.723.1, G.726, G.728, G.729, G.729A, G.729AB, GSM, MELP, etc.) to reduce the echo from local or customer hardware. Like all of VOCAL’s software libraries, our G.168 line echo cancellation algorithm is available in a variety of forms, including ANSI C and assembly language implementations optimized for leading DSP architectures. 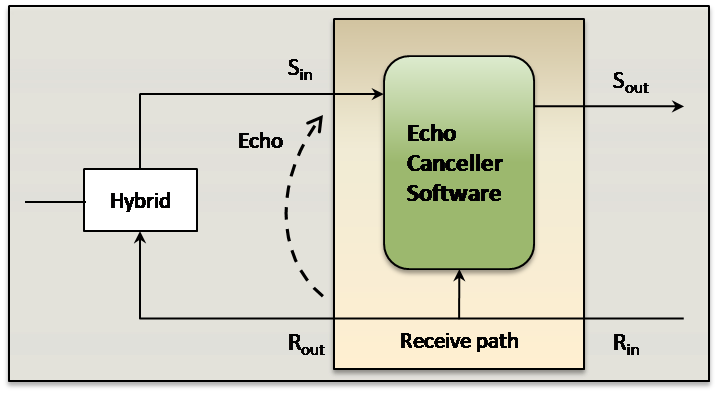 The line echo canceller libraries are modular and can be executed standalone with its own microkernel or as a single task under a variety of operating systems. As an experienced leader in this field, VOCAL has identified shortcomings in the G.168 standard and has implemented several additional test sets to guarantee world-class performance of our G.168 line echo canceller software in the harshest acoustic environments. All of our line echo cancellation modules must pass these VOCAL specific tests in addition to the standard ITU G.168 Test Suite, as well as undergo voice testing in our labs. VOCAL’s software is available for the following platforms. Please contact us for specific G.168 supported platforms and performance data.